Please join us for Girls Rock! 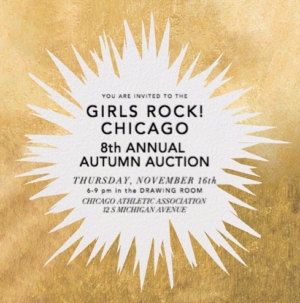 Chicago’s Eighth Annual Autumn Auction on Thursday, November 16th at the beautiful Chicago Athletic Association Hotel from 6 – 9 PM. We’ll be serving cocktails and hors d’oeuvres with plenty of unique items and experiences for you to bid on. All tickets will be held at the door with our guest list, and there is no need to bring a receipt. Our deepest thanks to Land and Sea Dept. for generously sponsoring this event. Tuition to Let’s Rock Camp 2018 / Tuition to Girls Rock Camp 2018 + GR!C swag + first choice instrument! / Chicago Blackhawks tickets / Curated 10 LP set from Reckless Records / Weekend retreat at a Door County lake house / Sourcepoint Healing Session with Magnolia House / Two one-hour massages with Reilly Gill, LMT / Stay at a skyline bed & breakfast / Sprout Home Chicago gift basket / Art by Dan Grzeca / Dark Matter Coffee gift basket / Whiner Beer Company Brewery Tour / Tour, tasting, and roasting at Metropolis Coffee Company / Facials & microblading at Enfuse Medical Spa / Handmade pottery by Annie Coleman / Photo session with Emma Meyer Photographry / Vichcraft gift basket / Artwork by Chris Hefner / Burger bonanza from Kuma’s Corner / Ticket subscription to The Promontory / Primo camping gear from Yeti / complete set of Cards Against Humanity / professional makeup from Kryolan / couple’s retreat at Allyu Spa / cut and color at Nomobo Salon / two trapeze classes at TSNY / weekend retreat at midcentury lakehouse in rural Wisconsin / bluetooth earphones from Shure / Chicago Symphony Orchestra tickets / two tickets Angel Olsen at The Riviera Theatre / two tickets to Todd Rundgren at Park West / gift certificate to Southport & Irving / voice lesson with Elaine Dame & Jennifer Hall / Ableton Live Standard from Reverb / Gretsch Boxcar round neck guitar / Field Notes gift box / Chicago Theatre package including Lookingglass Theatre Company tickets / Two VIP Pitchfork Music Festival passes / Make-your-own-Vans shoes / & SO MUCH MORE!